I was discussing insects as food online one day with friend and fellow foodie Dale, who asked if I had ever tried silkworms. Since the answer was "No" (I would have remembered that), he told me that he had enjoyed them at Min Sok Chon, a Korean restaurant in San Diego. On my next trip to San Diego I decided to follow his suggestion and have Korean food for lunch. Imagine my dismay when I pulled up to the restaurant to find it not only closed, but CLOSED. Since I foolishly assumed that all Korean restaurants must feature this taste treat, I walked into the Korea House next door and asked the hostess if they served silkworms. She seemed unfamiliar with the word, and when I started describing it as an insect or a worm, her eyes lit up in recognition. She drew a picture on a scrap of paper that looked like a fat maggot and asked if that's what I was looking for; since I had never seen a silkworm, I nodded to confirm. I figured that even if I was wrong, I was looking at sampling some kind of worm-like creature. Sadly, she said that they didn't serve them there, but suggested the Korean grocery across the street and told me to ask for beondegi. I was having some difficulty with the pronunciation, so she wrote the name in Korean on the piece of paper. I drove across the street to the First Korean Market and made a bee-line to the meat counter, showing the butcher the piece of paper. He walked me up one of the aisles to a stack of small cans that he identified as the silkworms I had been looking for. He must have seen the doubt in my eyes, since the sign below the stack of cans identified it as "fish food." He assured me that this was the Holy Grail I sought, and that they were delicious heated up in a frying pan. At about $1.50 a can, I bought two; since the minimum purchase was $10 I also picked up some kimchi and mixed rice crackers with whole dried anchovies. My confusion was in no way lessened when I looked at the receipt that listed the silkworms as "bird feed." As I later found out, beondegi are not silkworms. Silkworms are the larvae stage of a moth in a form we normally refer to as a caterpillar. Before turning into a moth, the silkworm wraps itself into a silk cocoon and changes form again, this time as a pupa; this is what is eaten as beondegi. The practice comes from the collection of the silk - the cocoon is boiled in water, then unraveled and spooled. 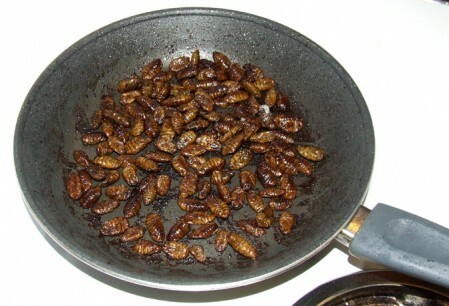 In factories where this was done, the cooked pupa provided a quick snack with no break required. I was a bit taken aback when I opened the can, as the pupa looked like puffy, flat cockroach abdomens, but I had an emotional investment in seeing this meal through to completion. I dumped them in a frying pan with some olive oil and stir-fried them until they darkened up. Served with the kimchi, they were surprisingly tasty - meaty, chewy and rich adding a nice texture to the meal. A word of caution - if you decide to stir fry them, keep in mind that they are packed in water, and even after draining them, when the water hits the oil they jump out of the pan like popcorn. 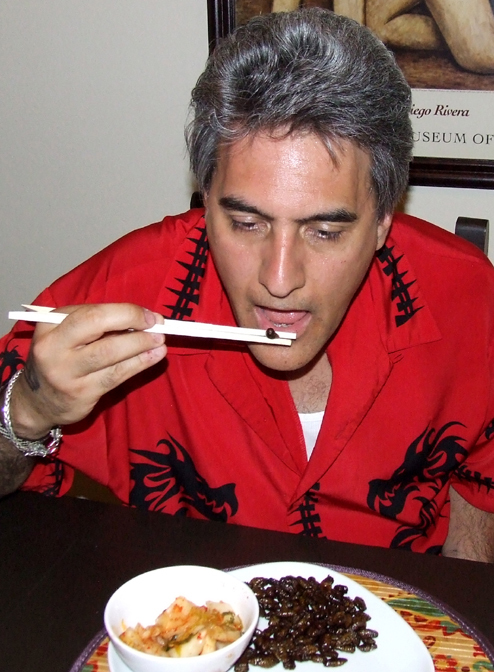 This entry was posted in Uncategorized and tagged beondegi, bizarre, California, insects, Korean, San Diego, silkworms, Trippy Food (Tasty flora and fauna). Bookmark the permalink. One Response to Got Silk? Really enjoyed your piece! 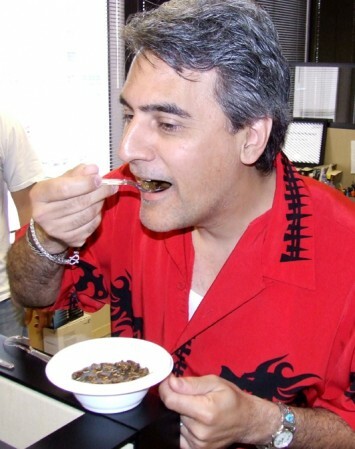 I’m doing an article on entomophagy for my Malaysian English newspaper in line with the UN FAO’s proposal to introduce insects as food to the world to combat global warming & food security. Salute you for being so adventurous!